Not a fan of little green cruciferous veggies? 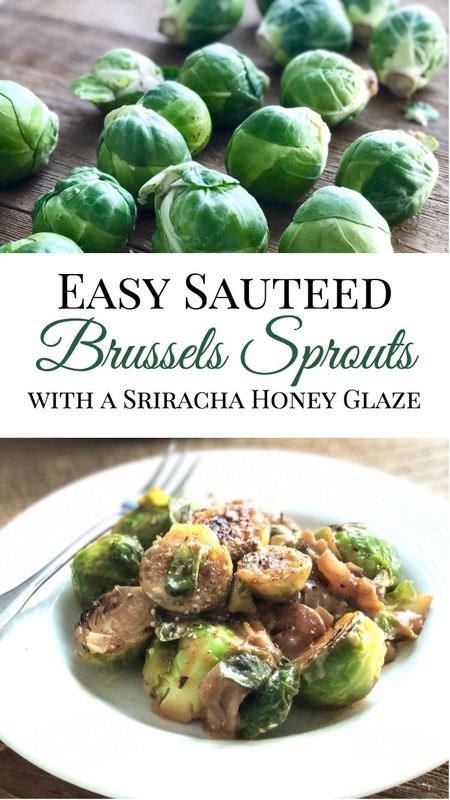 You will be after trying these super easy sauteed brussels sprouts in a delicious sriracha honey glaze! I grew up hating brussels sprouts. Or at least I thought I did. My mom wasn’t a huge fan, so it wasn’t really a star item on the menu around our house. I really didn’t try them for the first time until I was an adult and imagine my very pleasant surprise when I found out they were actually pretty tasty roasted right out of the oven. It is because of brussels sprouts and broccoli that I briefly became obsessed with roasting all the things. Fast forward to now and this #momlife doesn’t always allow time to roast a side dish for dinner, mainly because I have to wait for the oven to heat to a pretty high temp for it to be effective. I wanted something equally as tasty that could be thrown together in a pan and on my plate in about 10 min or less. 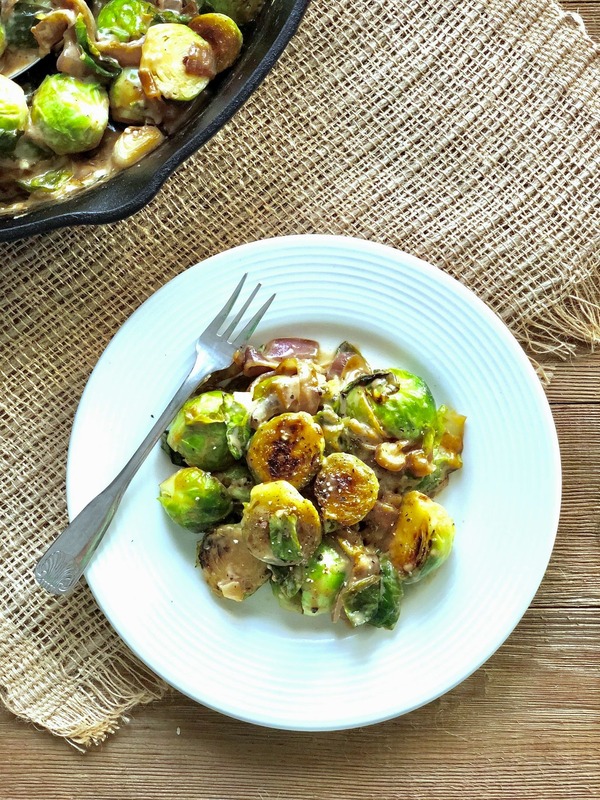 After several variations, this sauteed brussels sprout recipe is the final product and it is no less than spectacular. They are cooked just until tender and then quickly carmelized with a delicious creamy sriracha honey sauce that makes you want to lick your plate clean. Seriously, I was scraping the last of the sauce directly off the pan before my husband did the dishes. So basically, I got to make a mess, eat some amazing sprouts and then walk away to do something NOT having to do with dishes. There is no better kitchen victory. 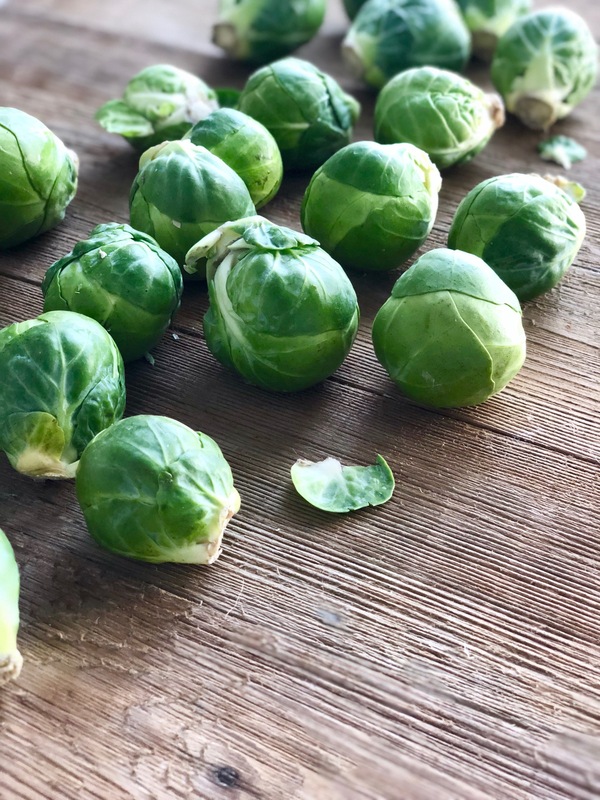 After doing some research, it seems that a large number of people hate brussels sprouts because well, they really can taste gross. It all comes down to preparation. The little green veggies need to cook just to the point of tenderness and then get them away from the heat. When overcooked, they tend to become super mushy and have more of a sulfur-like taste. Yuck. No wonder they have such a bad reputation! With these sauteed brussels sprouts, they are best cooked just until a nice dark green color appears and they are slightly tender when poked with a fork. Finishing them in a sauce that is sweet will help cut any bitterness that might still rear it’s ugly head. Plus, ummm, it has sriracha – which is everything. I also love it in these awesome BAHN MI TACOS WITH SRIRACHA MAYO. IMO, you add honey and sriracha to anything and you just made gold! Not a fan of brussels sprouts? You will be after trying these pan seared veggies caramelized in a delicious sriracha honey glaze. Perfect side dish for the holidays or any weeknight meal! Cut the ends off brussels sprouts and cut them in half. Slice red onion into thin half moons. Heat a large cast iron or non-stick skillet over medium-high heat. Add 1 tsp coconut oil. Saute onion 2-3 minutes or until onion begins to soften and caramelize. Add brussels sprouts, salt, and pepper. Cook until sprouts begin to brown and stick a little to the pan about 4-5 minutes. While sprouts are cooking, combine veganaise, honey or agave, and sriracha together in a bowl and set aside. Add 1/3 cup water to pan to steam sprouts. Cook for another minute or until water absorbs. When brussels sprouts have started to soften (not mushy...don't overcook or they will taste bitter!) add sauce, stir and turn off heat, but leave on the burner for another minute. Serve warm and enjoy! I always love trying a new brussels sprouts recipe each year for Christmas. Definitely going to give this one a try this year! Thank you Nicola! I hope you love them and have a wonderful Christmas! This one might get past even your toughest critics ;) Let me know if you try it and how it went over! We love brussels sprouts in this house – especially roasted like this. Lovely recipe and great as a side dish for a holiday roast. Yes it is perfect for a holiday side dish!! I love Brussel sprouts!! Can’t wait to try this sriracha honey glaze on it. Thanks for sharing..Yum! I hope you love it!! The sauce really adds something different and delicious! First of all, I love that you have the “jump to the recipe” button for when I come back to this page. I love that!!!! The titles of your recipes draw me in almost as much as the photos. MmmmMmm. I am a big fan of brussel sprouts. I love that I can make this recipe Vegan. I am going up to my In Laws for Christmas. I think I might make these for christmas eve or the day before. I love the jump to recipe button as well!! It’s an awesome feature in the WP-Recipe Maker Pro Version. At first I was skeptical about paying for a recipe plug-in, but it is so much cheaper than most, allows you to link products and has cool features like the “jump to recipe” button. It also is one of the highest rated SEO recipe plugins. I haven’t looked back since ;) Let me know if you get to try the sprouts…they are perfect for all the holiday meals coming up this week!! I know right! Really sriracha honey sauce on anything and I’m sold lol!! Thank you for your kind words! These look amazing! We love brussel sprouts, but tend to always make them the same was ( roasted). So, I have been looking for new ways to do them. Thanks! I love roasted too!! These are definitely a fun alternative without losing that yummy flavor and take half the time as well! The JUMP to a recipe is awesome! My husband was just talking about how he wished more websites had a feature like that! We aren’t huge Brussel spout people, but I am trying! I made some with just salt, pepper and garlic the other day. They were tasty- but a little overdone, I’ll have to try your recipe next! YUM! 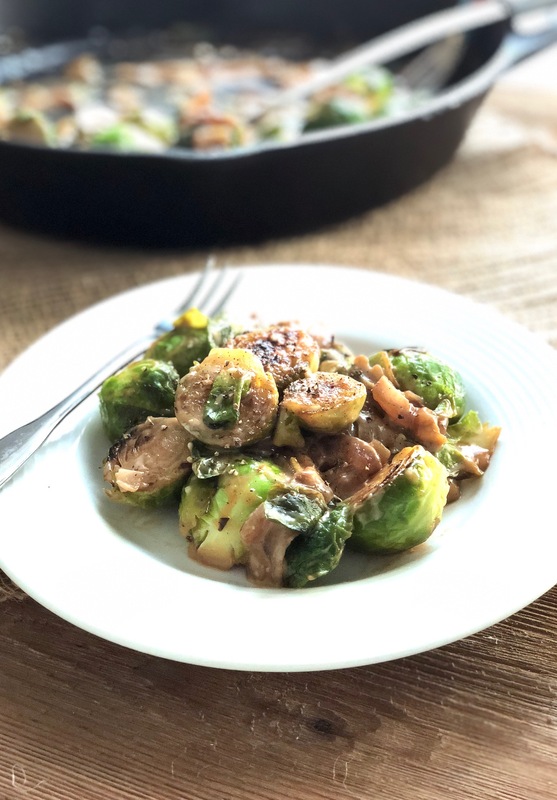 I love brussels sprouts, I usually roast them – but I’m going to do this recipe once I get back from the holidays!! Beautiful pictures as always! I looooove Brussel sprouts! And these sound delicious! I will definitely be giving these a try! Thanks Priscilla! I hope you love this tasty version! !